The humble little tamago-yaki is actually one of the most troublesome omelettes to make, and as such, it was used in the past to judge the standard of a sushi eatery as the sushi chef made their own tamago-yaki everyday. Great effort and skill is used to create those fluffy little blocks of carefully rolled eggs and the best tamago-yakis feel airy and spongy when you eat them. It takes a lot of time and practice to get it done properly and there are so many reasons why it can go wrong, like not aerating the eggs enough, or getting the heat wrong, or not letting enough moisture evaporate. That is why now most restaurants just use pre-made blocks of frozen tamago-yaki, which are an affront to those who appreciate how nice a tamago-yaki made with real effort can taste like. To make this tamago-yaki, I cheated of course as I didn’t have that much time to practice and my $2 Daiso tamago-yaki pan was too crappy to make a proper one so I just used the smallest non-stick pan I had. The ingredients used were fairly simple: 4 eggs, 1/4 tsp of salt, 1 tbsp mirin and a few drops of shoyu. I didn’t take any photos of the process because it’s quite impossible to do it and snap a photo since the egg cooks rather fast. So I’ll just give the steps to making it and the final product. 1. Heat the pan to medium heat, and then swab it with an oiled cloth so that there’s a very thin film of oil. 2. 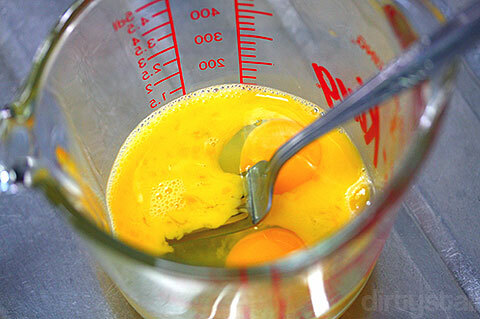 Pour in small portion of the egg mixture and tilt the pan until the egg covers the entire pan evenly. Break any air bubbles that appear, then while the egg is still slightly runny in the center, tilt the pan towards you and use a pair of chopsticks or spatula to roll the far side of the egg towards you. 3. Move the rolled up egg to the far side and oil the pan lightly again. Pour in another portion of the egg mixture and spread it evenly across the pan, lifting up the egg roll to let some of the raw egg mixture to go underneath. 4. Repeat the same procedure of steps 1 to 3 again until all of the egg mixture is used up. 5. Remove the egg roll from the pan and place on a bamboo mat to wrap up and shape the roll. Leave to rest for a few minutes, then unwrap and cut it up into thick slices a few fingers wide to serve. And here is the cross-section which is not too bad at all! 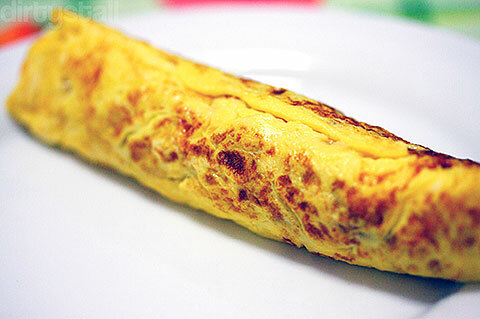 This type of tamago-yaki that you commonly see around is actually known as the atsu tamago. 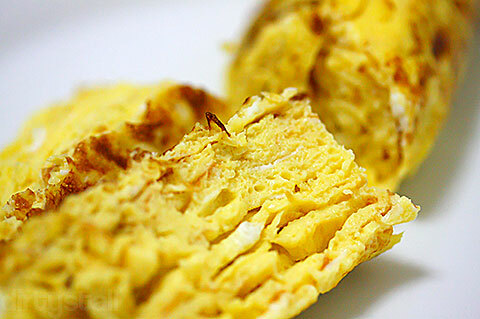 Another type of tamago is the usuyaki tamago, which is used to to make stuffed sushi like the fried tofu skin pouches. Sometimes you will also find usuyaki tamago sliced into thin strips and layed across chiraishi dons. This style of tamago is then called kinshi tamago, or “golden strings”. Hehe yah I really love to eat eggs! I agree that a lot of times the eggs in restaurants aren’t very nice, I find the best tasting eggs actually in hawker centres, especially the egg fuyong at most zi char stalls. Ah, haven’t made this in a long time! 😀 Looks delish! i’m really wondering how tatsuya managed to get chinese characters printed on their tamagoyaki!